The Database of Vital Statistics from New Brunswick Newspapers, based on over twenty-three years of work by Danny Johnson, is an extraordinary contribution to genealogical, biographical, demographic and historical research. The Provincial Archives of New Brunswick is honoured to present it on their web site as a tribute to Danny and a resource for researchers. Daniel Fred Johnson was born on August 25, 1953 in Fort Fairfield, Maine, the youngest child of Fay (Tregunno) and Verdell C. Johnson. He grew up in Perth-Andover and graduated from Southern Victoria High School in 1971. He obtained a Bachelor of Business Administration from the University of New Brunswick in 1975 and settled into employment in the commercial and insurance fields. Danny's early attentiveness to family stories and his own love of telling stories presaged his later passion for history and genealogy. His first employment in the field was as manager of a project sponsored by the Victoria County Historical Society collecting stories of the county for their annual publication, the Tobiquer. He stayed with the project long past its formal termination and between 1979 and 1990 edited the stories and saw to their publication. The undertaking fostered his interest in history, genealogy and publishing. Danny's work on his own family history and the knowledge and skills he gained as he did his research led to a broader involvement in genealogy and he began to assist with the searches of others. He taught one of the first organized courses in genealogy in Saint John in 1979. Along with a number of his students from that course, and others, Danny was instrumental in founding the New Brunswick Genealogy Society. He served as president of the Saint John Branch of the New Brunswick Genealogical Society and as vice-president of the provincial body. He was also one of the first people to obtain certification through the Genealogical Institute of the Maritimes and he remained supportive of the Institute's goal of achieving high standards of professionalism in genealogy. He was a frequent presenter at genealogical workshops and conferences, he transcribed cemetery records, provided a genealogical research service for those who could not get to New Brunswick sources to do their own research, and he advised and helped genealogists from across Canada and around the world, always generously and often gratuitously, always finding satisfaction in their successes. Danny was quick to embrace the computer as a tool for genealogy. He quietly and competently became one of the pre-eminent leaders in New Brunswick genealogy as genealogy became his passion and his full time occupation. Danny was interested also in the history of New Brunswick, particularly of Kings and Queens Counties, Saint John, the Loyalists, pre-Loyalist settlement and the military settlements of his native Victoria County. He was author of a number of articles and books on subjects ranging from specific families, to Jack the Ripper, to compilations of sources and records that would assist genealogists, such as World War l - Canadians at War: Victoria and Carleton Counties. In 1995, in recognition of his outstanding contribution to local history and genealogy, Danny was awarded the Certificate of Merit by the American Association for State and Local History. Danny died February 22, 2005. The work for which Danny would become best known was his publication of Vital Statistics from New Brunswick Newspapers. As chair of a group of members of the New Brunswick Genealogical Society Dan began work on the vital statistics project in 1982 that realized the publication of a small volume titled New Brunswick Vital Statistics from Newspapers 1784-1815. They went on to produce four more similar volumes covering the years up to 1834, in effect, the first fifty years of newspapers in New Brunswick. The group wound up its work in 1985 but over the course of the next 20 years, Danny single-handedly continued this project extending the project to the year 1896 and producing a total of 102 volumes. The first volume covered over 30 years of newspapers and contained a total of 1649 entries; later single years required four separate volumes, with each volume running to over 3000 entries. Danny worked persistently and comprehensively mining all English-language New Brunswick newspapers available in original form or on microfilm. He copied out notices of births, marriages, deaths, and also of ship wrecks, trips outside the province and many other events, all containing names that would further the search for an ancestor. The work is remarkably accurate although as Danny was not a strict proof reader, preferring to use his time to push ahead with indexing and transcribing, occasional typographical errors crept in. Danny sold many copies of the Vital Statistics volumes to libraries, historical societies and individuals over the years and maintained a list of on-going subscribers. Danny kept the extracted information in a database to which he later added a search capability enabling him to provide a service to researchers who did not have access to the published volumes. In celebration of the first 100 volumes of Vital Statistics, he produced a CD index of the entire series. It is hard to convey what a monumental undertaking the vital statistics project was and what a unique and invaluable benefit it is to research. The assistance and collaboration of a number of people who knew and respected Danny have made possible the addition of this very valuable research tool to the Provincial Archives web site: Celia Charlton and Mark Johnson, sister and brother of Danny and his mother, Fay Johnson; friends and colleagues, Joan Pearce, Ron Keith, John Elliott; Ian Wilson, Keith MacKinnon and reference staff at the Saint John Free Public Library who contributed the bibliography; the Associates of the Provincial Archives of New Brunswick, the Capital, Saint John, and South Eastern Branches of the New Brunswick Genealogical Society, and a number of individuals for financial contributions for the acquisition of the database. American Civil War: The Service Records of Atlantic Canadians with the State of Maine Volunteers. Saint John: D.F. Johnson, 1995. Cedar Hill Extension Cemetery : Saint John, N.B., Canada. Saint John: D.F. Johnson, 1989. Descendants of Nathaniel Johnson and Sarah Mersereau. Saint John: Daniel F. Johnson, 1984. Foot-Prints in time. Saint John: New Brunswick Historical Society. 1994. The Irish emigrants & their Vessels: Port of Saint John, New Brunswick, Canada, 1841 to 1849. Saint John: D.F. Johnson, 1996. Irish Emmigration Through the Port of Saint John, New Brunswick, Canada, 1841 to 1849. Saint John: Clearfield, 1998. The Johnson family of the millstream: descendants of Nathaniel Johnson, 1741-1829. Perth-Andover: D.F. Johnson, 1980. New Brunswick census of 1851 for Victoria County. Perth-Andover: D.F. Johnson, 1979. New Brunswick lineages : the ancestral charts of over 250 researchers who trace their lineage to New Brunswick, Canada. Saint John: Daniel Johnson, 1988. The New Brunswick genealogist. Saint John: Daniel Johnson, 1988. The newsletter of the New Brunswick Genealogical Society. Saint John: Daniel Johnson, 1993. The Old Cedar Hill Cemetery and Carleton Burial Ground of Saint John West, N.B. Canada. Saint John: D.F. Johnson, 1990. Passengers to New Brunswick: the custom house records, 1833, 34, 37 & 38. Saint John: Saint John Branch, New Brunswick Genealogical Society, 1987. Saint John county Alms and Work House records, 1843-1850. Perth-Andover, N.B: D.F. Johnson, 1985. The South African war, 1899-1902: New Brunswick men at war. Saint John: D.F. Johnson, 1989. Tobique Indian Reserve (Researcher/Compiler Daniel F. Johnson). Perth-Andover, NB? : 1987. Vital statistics from New Brunswick newspapers. Fredericton, N.B., Canada: New Brunswick Genealogical Society, 1982. World War I: Canadians at war, New Brunswick: Victoria & Carleton counties : military biographies of the men who enlisted in World War I from the counties of Victoria and Carleton, New Brunswick, Canada. 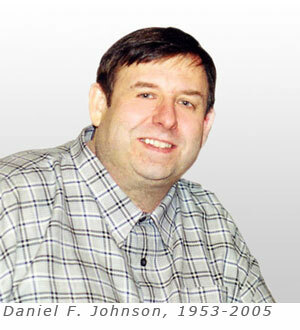 Saint John: Daniel Johnson, 2003. “Amazing Dr. Tumblety.” Generations 43 (March 1990): 12 - 14. “Baby Photo Contest of 1909.” Generations 21.4 (Winter 1999): 60. “Crime and Punishment in 1884.” Generations 64 (Summer 1995): 10. “DeMill Family.” Generations 18.1 (Spring 1996): 30. “1851 Census Returns. St. Martins East Point.” Generations 6 (November 1980): 23 - 24. “Glimpses at Some New Brunswick Burial Grounds.” Generations 65 (Fall 1995): 42 - 48. “Graduates of University of New Brunswick from 1828 to 1900.” Generations 54 (Winter 1992): 9 - 22. “Grandmothers of King County.” Generations 22.4 (Winter 2000): 13 - 18. “Indiantown 1863-1865.” Generations 31 (March 1987): 17 - 27. Johnson, Daniel and John R. Elliot. “Kierstead Mountain Baptist Cemetery.” Generations 40 (June 1989): 52 - 57. “Loyalist Graves at Kingston, Kings County, New Brunswick.” Generations 20.3 (Fall 1998): 9 - 12. “Lunatic Assylum.” Generations 32 (June 1987): 42 - 44. “Maritimers in the American Civil War.” Generations 33 (September 1987): 62 - 65. “Masters & Mattes 1871-1893.” Generations 25.4 (Winter 2003): 2 - 6. “Masters & Mattes 1871-1893.” Generations 25.2 (Summer 2003): 2 - 6. “Masters & Mattes 1871-1893.” Generations 25.1 (Spring 2003): 2 - 6. “Militia Returns. Campobello and York County.” Generations 52 (June 1992): 39 - 42. “Ministers.” Generations 32 (June 1987): 45 - 47. “Miscellaneaous Passenger Lists to New Brunswick.” Generations 7 (February 1981): 36 – 37. “Murder of Captain Clayton Tiltes.” Generations 10 (December 1981): 28 - 30. “Naturalization Papers.” Generations 9 (October 1981): 28 - 33. “New Kincardineshire. Perth Parish, Victoria County, New Brunswick.” Generations 47 (March 1991): 2 - 11. “News & Notes – The Empty Library Shelf.” Generations 63 (Spring 1995): 64. “Normal School Students. Fredericton, New Brunswick August 1885.” Generations 66 (Winter 1995): 21 - 22 . “Normal School Students. Fredericton, New Brunswick January 1885.” Generations 66 (Winter 1995): 18 - 20 . “Old bible Inscriptions.” Generations 23.2 (Summer 2001): 32. “Old Burial Ground, St. Stephen.” Generations 64 (Summer 1995): 23 - 24. “Old Steamboat Days on the Lower St. John.” Generations 19.4 (Winter 1997): 2 - 4. “Pioneers of King’s County pt 1.” Generations 5 (August 1980): 1 - 2. “Roots of the Mysterious Stranger.” Generations 64 (Summer 1995): 10. “Royal West India Rangers.” Generations 11 (March 1982): 28 - 34. “St. Simon & St. Jude Anglican Church Cemetary, Belleisle Creek.” Generations 41 (September 1989): 39 - 47. “The Sharp Family.” Generations 2: 24. “Soldiers of the King’s New Brunswick Regiment.” Generations 55 (Spring 1993): 8 - 12. “State of Accounts.” Generations 2 (September 1979): 1- 10 . “Treasure Trove or Pile of Junk.” Generations 24.3 (Fall 2002): 21. “Voyage from Kinsale, Ireland to Saint John.” Generations 26.1 (Spring 2004): 6 - 8. “Was Brigham Young a Descendant of New Brunswick U.E.L Loyalist?” Generations 42 (December 1989): 2 - 5.